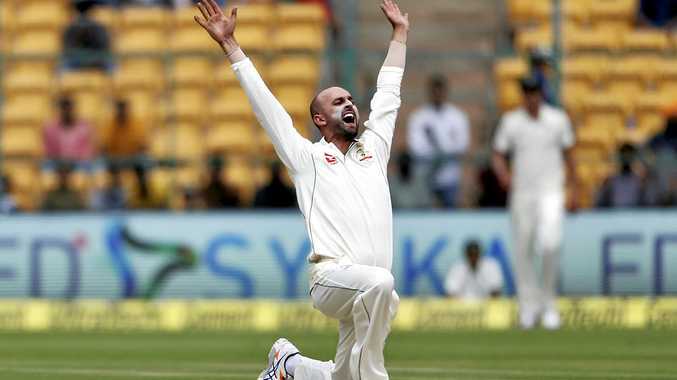 AN INCREDIBLE eight-wicket haul from Nathan Lyon has put Australia well on top on day one of the second Test against India. Lyon sealed his five-for when he had Wriddhiman Saha caught at slip for one, leaving India at 7-178 after electing to bat before running through the tail to have the hosts all out for 189. Lyon finished off by taking the wickets of Indian opener KL Rahul (90) and Ishant Sharma (0) with the final two balls of the first innings meaning he'll be on a hat-trick in the second innings, earning him the remarkable figures of 8-50. The off-spinner opened his account by removing Cheteshwar Pujara (17) on the cusp of lunch, before outfoxing Virat Kohli (12), Ajinkya Rahane (17) and Ravi Ashwin (6). For the second innings in a row Kohli fell shouldering arms, leaving a Lyon delivery on to his pads plumb in front of the stumps. To make matters worse for India, he then burnt a review. Mitchell Starc and Steve O'Keefe have each chipped in with a wicket, with the quick trapping Abhinav Mukund (0) in front and the spinner having Karun Nair (26) stumped. That was wicketkeeper Matthew Wade's second stumping of the day, with the Victorian earlier recovering from a fumble to catch out Rahane (17). Having premeditated a charge against Lyon, Rahane was undone by a delivery pushed up outside off and stumped well short of his crease.